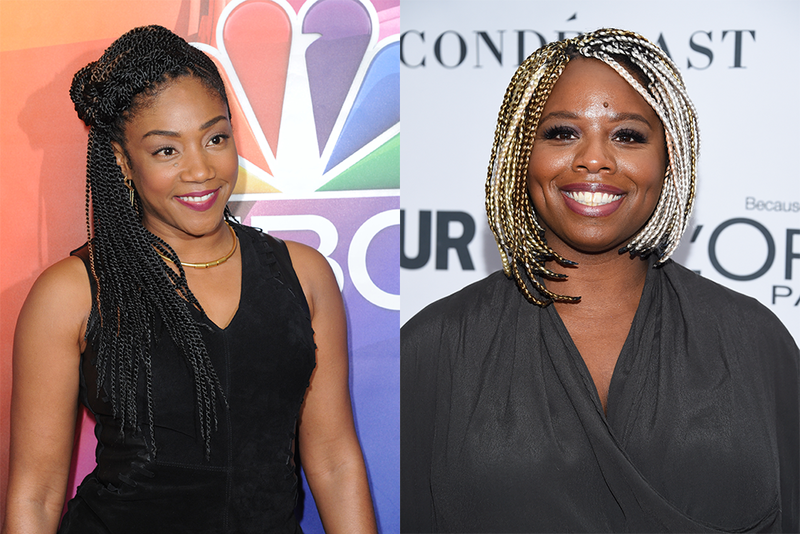 In very different ways, both Tiffany Haddish (left) and Patrisse Khan-Cullors turned the personal pains of growing up in L.A. into a source of power. Left: Photo by Richard Shotwell/Associated Press. Right: Photo by Evan Agostini/Associated Press. But, in distinct ways, the women show how to turn the pain of Los Angeles into national power. In their telling, the worst of L.A.—its discrimination, neglect, and public agencies so awful that they were taken over by other governments—helped forge strong identities. And the best of L.A.—its diversity—taught them how to speak to the broadest audiences. Both women learned bitter and useful lessons in the San Fernando Valley. Khan-Cullors recalls growing up in a Section 8 apartment in a poor, mostly Mexican-American corridor of Van Nuys, where takeout restaurants pass for community anchors. “Ours is a neighborhood designed to be transient,” she writes. Haddish was a South L.A. kid, but she rose daily at 5 a.m. to ride a school bus to Woodland Hills. But outside of school, both learn the lesson that L.A. doesn’t really care much about the lives of its kids—especially black, poor ones. The book is particularly powerful—and infuriating—in recounting how Khan-Cullors’s brother, Monte, a schizophrenic, is charged with progressively more serious crimes (“I spent my childhood watching my brother get arrested”), even though he doesn’t physically harm anybody. Monte is beaten, tortured, and drugged in the L.A. County Jail during a time when, subsequent investigations showed, such abuse was a regular practice of the county sheriffs. “It didn’t feel like anybody gave two f^*ks about me, unless it was benefiting them. Unless they was getting paid,” she says, recalling that her grandmother insisted on being compensated for a stint as her foster mother. “Me just being myself was never good enough for anyone to love me.” She falls into difficult relationships with men—some of them cops to whom she is drawn because of the illusion that they provide safety. “I end up picking jealous and possessive guys, because in some sick, twisted way, I think that means they care,” she writes. In the face of awful realities, both women conclude they have little choice but to assert themselves. Khan-Cullors builds a commune of activists and artists, defying police raids. She helps organize the first Black Lives Matter march, strategically held in Beverly Hills, to gain broad notice. She finds that having had to navigate the many different peoples of L.A. allows her to build diverse alliances—and to make Black Lives Matter a truly democratic organization. Perhaps it’s easier to be intersectional if you’re from a city with so many intersections.